PHILADELPHIA  A federal appeals court on Tuesday ordered a new sentencing hearing for convicted police killer and death-row activist finding for a second time that the death-penalty instructions given to the jury at his 1982 trial were potentially misleading. Tuesday's ruling is the latest in Abu-Jamal's long-running legal saga. A federal judge in 2001 first granted him a new sentencing hearing because of the trial judge's instructions on aggravating and mitigating factors. Philadelphia prosecutors have been fighting the order since, but the 3rd Circuit ruled against them in a pivotal 2008 decision. In rejecting a similar claim in an Ohio death-penalty case last year, the Supreme Court ordered the Philadelphia appeals court to revisit its Abu-Jamal decision. On Tuesday, the 3rd Circuit judges stood their ground and noted differences in the two cases. Under Pennsylvania law, Abu-Jamal should have received a life sentence if a single juror found the mitigating circumstances outweighed the aggravating factors in Faulkner's slaying. The three-judge appeals panel found the verdict form confusing, given its repeated use of the word "unanimous," even in the section on mitigating circumstances. "The Pennsylvania Supreme Court failed to evaluate whether the complete text of the verdict form, together with the jury instructions, would create a substantial probability the jury believed both aggravating and mitigating circumstances must be found unanimously," Judge Anthony J. Scirica wrote in the 32-page ruling. The decision upholds the 2001 ruling by U.S. District Judge William H. Yohn Jr., who first ruled that the flawed jury instructions warranted a new sentencing hearing. While prosecutors were fighting that ruling, Abu-Jamal has been trying unsuccessfully to have his conviction overturned. Faulkner, a white 25-year-old patrolman, had pulled over Abu-Jamal's brother on a downtown street at about 4 a.m. one morning in 1981. Abu-Jamal, a former radio reporter, was working as a cabbie at the time. According to trial testimony, Faulkner stopped the brother, William Cook, for a driving infraction. Abu-Jamal, from his taxicab across the street, saw them scuffle and ran toward the scene. Police found Abu-Jamal wounded by a round from Faulkner's gun. Faulkner, shot several times, was dead. A .38-caliber revolver registered to Abu-Jamal was found at the scene with five spent shell casings. 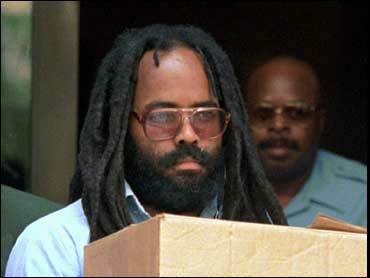 Abu-Jamal, born Wesley Cook, turned 58 on Sunday. His writings and radio broadcasts from death row in western Pennsylvania have made him a cause celebre and the subject of numerous books and movies. His own 1995 book, "Live From Death Row," describes prison life and calls the justice system racist and ruled by political expediency. Hundreds of vocal supporters and death-penalty opponents regularly turn out for court hearings in his case, even though Abu-Jamal is rarely entitled to attend.